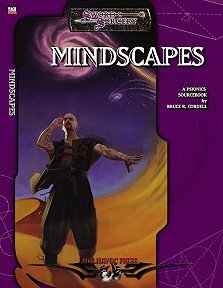 Print compilation of Mindscapes: A Psion's Guide and Mindscapes: Beasts of the Id, this product contains a wealth of material to support and enhance psionic adventuring. Publisher's blurb: "This sourcebook is just what you've been waiting for! In response to reader requests, D&D Psionics Handbook designer Bruce Cordell brings us a new psionics classbook and bestiary. Mindscapes presents a unique alternate psionic combat system, a dozen new prestige classes for psionic characters, 99 all-new feats, powers, and items and 18 original psionic monsters for characters to summon - or face in battle!"